Cathy's Card Spot: Happy 18th! It's my niece's 18th birthday in a couple of days, so I'd better get this card posted tomorrow! I took ages to get started as I couldn't decide what to do! I hope she likes geckos. I know she doesn't see my blog so it will still be a surprise. At Simon Says Stamp Monday challenge the theme is to use paste. 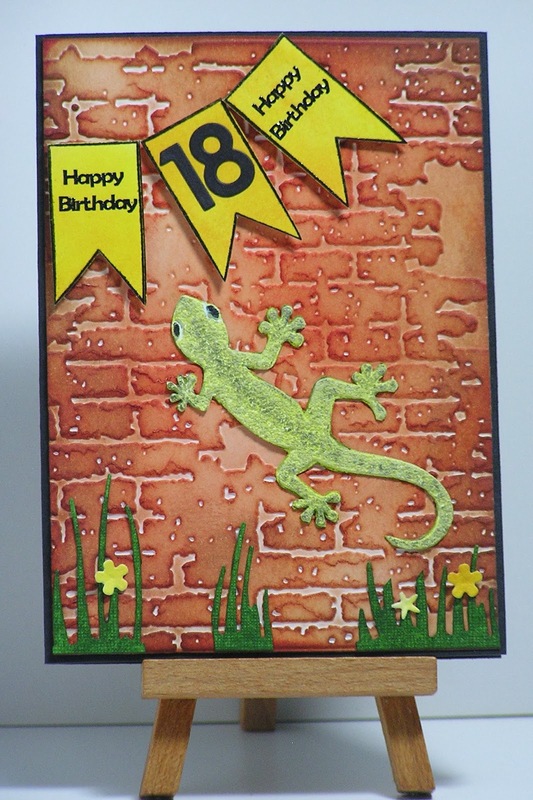 I had another go at making some of these geckos a few days ago using a Dreamweaver stencil and textured paste. I fussy cut them and coloured using distress ink and some pigment inks. Last visit my sister gave me some really long, biggish cue tips. Not sure what they're for but I used them to dab the ink on, I like the splotchy effect. Edited to add: The brick wall is an embossing folder and I've distressed it with about 3 inks. I used snippets galore on this card for the numbers and grass. The banners were stamped on a scrap that I distressed in yellows, and the flowers were diecut from a scrap of that. I'm linking up to the snippets playground at Pixie's Crafty Workshop. 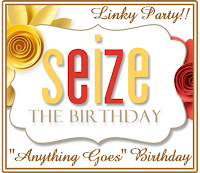 At Seize the birthday it's an anything goes birthday project. Materials used: Dreamweaver stencil; brick embossing folder; distress inks; pigment inks: Maya Road banner stamp; Memory Box number, flower & grass dies; tiny sentiment stickers from stash. Hi just poppi g by from di snippets playground. I love your gecko on the wall card! It's fun and different. You rocked the paste to make that bricked wall. This is a very fun card and your niece will be quite pleased with it. I came over from Pixie's Crafty Playground to wish you a crafty day! Love how the gecko climbs up that brick wall! Cool that it was made with texture paste and cut out! Lovely texture! The brick wall has such lovely depth and the paste gecko is clever with the texture and color! Thanks for joining in our paste fun at Simon Says Stamp Monday Challenge! Love the embossed wall! Perfect home for your little gecko! What a great brick wall and that gecko looks almost real! I love this. So fun! I like Gekkos too since I got friendly with a few in Vietnam! I really love this card Cathy. You made that brick wall look so effective with your inks.